NZMS has a long history of attending and supporting the National Digital Forum Conference and this year we are excited to be presenting at the Demo Hall. 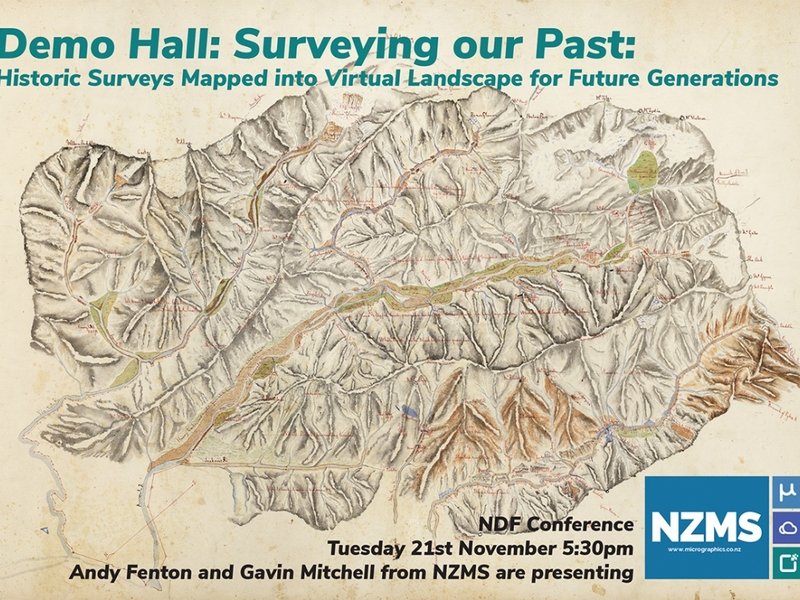 Andy Fenton and Gavin Mitchell will be presenting a discussion about; Surveying our Past: Historic Surveys Mapped into a Virtual Landscape for Future Generations. For many years organisations like Ngai Tahu and ECAN sought better access to early New Zealand maps (mahere rangahau) that were draughted by (prominent) surveyors in the mid-19th century and are stored for LINZ at Archives NZ today. These maps are extremely large – typically two meters deep and some more than 7 metres long – and extremely fragile due to deterioration over time. Even research in a reading room was difficult given they could no longer sustain being mounted on a wall as was there original access method 150-170 years ago and the ‘fine print’ on the maps was both historic (eg iwi tracks and plantings) and exquisite and finely detailed (eg smaller than 2-point font). User requirements were examined and the design of equipment and processes to capture and make available these maps to a high resolution and with ease of online navigation (pun intended). The result was the design of a complicated digitisation system designed to capture very fine detail on very large objects, and be portable enough to work onsite at Archives to minimise the impact on these valuable treasures. Once online the ability to enlarge and move around the map opened up a new way to learn and share. We describe the successful pilot undertaken to determine the best way to achieve this and how the collaboration between institutions has developed into a successful ongoing project to deliver digital access to a wide audience. We have unlocked the footprints and settlements of our settler and Māori forebears into a virtual landscape for future generations to view and interact with – and perhaps one day add into GIS and virtual reality programmes. Watch the Te Runanga o Ngai Tahu video which captures our VLF rig in action here. If you’re heading along to NDF this year, be sure to check out our discussion in the Demo Hall. We welcome you to talk with us after the discussion about any digitisation opportunities, large or small. Following the NDF Conference we will be holding a Recollect user group workshop on Thursday at our Head Office in Wellington. We always encourage our Recollect administrators to get together and share their ideas and successes with their Recollect sites.